Jared Unzipped: Deep Fried Turkey Can Be Dangerous If You're An Idiot. Deep Fried Turkey Can Be Dangerous If You're An Idiot. For quite a few years now, the act of deep frying a Thanksgiving turkey instead of cooking it in an oven has become quite common. Deep fried turkey is flavorful, juicy and offers a delectable twist to the traditional method of roasting. I can attest to this notion -- I had deep fried turkey yesterday and it was delicious! Unfortunately, not everyone employs common sense when deep frying a turkey. Based upon data collected by the National Fire Protection Association, there are approximately five deaths and over sixty serious injuries across America annually from incorrectly deep fried turkeys. Over nine-hundred homes also catch fire and are damaged from the ensuing flames. In total, this causes a minimum of $15 Million in damages. That's a mighty costly set of repeated errors! State Farm Insurance publishes an annual list of which states have the most Thanksgiving-related deep fried turkey accidents, based upon filed claims. Leading the pack is Texas, followed by Illinois, Pennsylvania, Ohio, New York, South Carolina and Georgia. Data provided by the U.S. Fire Administration shows that the rate of house fires and fire-related accidents doubles on Thanksgiving, with upwards of 4,300 or more. That's more than twice the national average on any other day. Considering the amount of cooking that's going on, it's easy to see why. Throwing the element of deep fried turkey into the mix certainly hasn't helped the situation. All this being said, any reasonable person with an ounce of common sense can correctly deep fry a turkey without incident. Here's some tips. - Make sure you're using the right amount of oil. Place the turkey in your frying pot. Fill the pot with water until the turkey is covered by 1/2 inch. Remove and dry the turkey thoroughly. Mark the water level. Dump the water, dry the pot very well, then fill with oil to the marked level. - Completely thaw your frozen turkey. 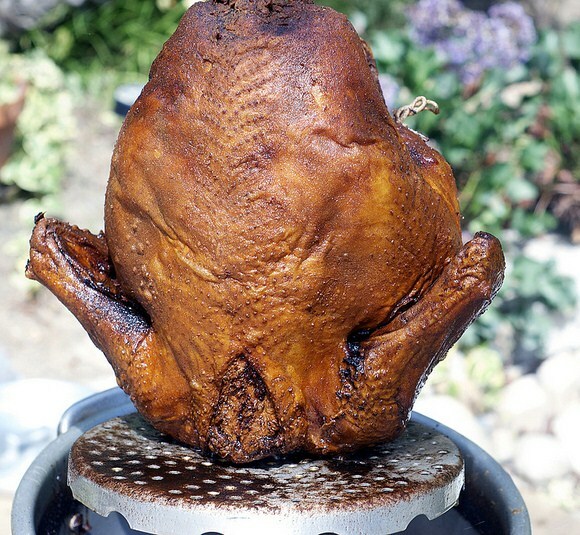 Deep frying a fully or partially frozen turkey is like a time bomb waiting to explode. I would even go so far as to recommend a fresh, never frozen turkey for deep frying. - Use the deep fryer in an open, well-ventilated location away from your home. - For goodness sake, do not deep fry a turkey inside your house. - Wear protective clothing. Don't deep fry your turkey without a shirt on. - Check your oil temperature regularly and keep it consistent! - Don't make any sudden movements around your deep fryer. Raise and lower the turkey carefully. - If a fire does occur, DO NOT SPRAY IT WITH WATER! Grease fires are only made worse with water. Keep a pile of sand or dirt nearby instead. Even better, make sure you have a working fire extinguisher. Follow these steps and you're sure to have a tasty deep fried turkey meal without any damage to your property or yourself. Now watch these idiots nearly kill themselves.